How to start the Traffic Blinker App? When you have installed the Traffic Blinker app on your iPhone 5, iPhone 5C, iPhone 6, iPhone 6 Plus, iPhone 6S or iPhone 6S Plus. Make sure you synced this app also to your Apple WATCH. The syncing takes about +/- 1,5 minute. Now you see the orange Traffic Blinker app icon, tap on it to open the app. And when you are ready to ride, press on the green "YES" button. The Apple WATCH app shows automatically the blinker 2 (orange flashing dots arrow) when you going to turn in to a street. This app is also customized, you can choose between 4 default blinkers. 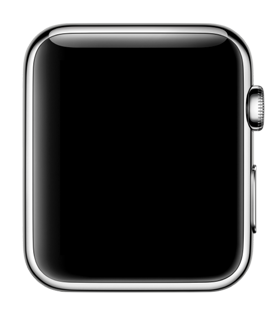 The first blinker is a solid rectangle that fills your whole Apple WATCH screen. The second is the orange arrow that is flashing on and off. The 3rd is a white arrow in the center of the screen, and within each corner an extra lamp for the flashing effect. And the last is a red stop text that is flashing. How to change the color of the blinker? When you do a hard press on the screen, you can change the color and animation speed of this blinker. The color you change is only for the current selected blinker, you can choose between more than 9 colors such red, orange, yellow, green, blue, purple and white. With a bonus of the "Police Europe" (a mix of blue and white as color) and "Police USA" (a mix of red and blue as color) theme. Below you see an overview of all the blinkers you can use in the Traffic Blinker Apple WATCH app. How to change the speed of the animation? This is the same steps as changing the color of the current selected Blinker. Do a hard press and tap, then on the Settings button, where you see then an overview what you can change in this blinker. Now choose the "Animation" in the menu list. The lower the animation number, how fast the blinker will turn off and then back on.